California, Southern California, Illinois, Michigan, Wisconsin, Tennessee, Kentucky, Indiana, Ohio, Mexico, Orange County, Los Angeles, Malibu, Pacific Palisades, Palos Verdes, Hancock Park, Hollywood Hills, Santa Monica, Bel Air, Laguna Beach, San Diego, Rancho Santa Fe, Palm Springs, Rancho Mirage, Santa Barbara, Montecito, Monterey, Nashville, Columbus, Cleveland, Detroit, Chicago, Highland Park etc. It is because of Christian’s commitment to service excellence that discerning clients and exceptional private chefs continually turn to Private Chefs, Inc. for their placement needs. Call (310) 278-4707 Now! 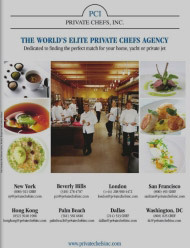 As the CEO of Private Chefs Inc., Christian Paier oversees all placements from the Beverly Hills, CA head-office to ensure quality of service. He and his team serve clients and chefs in regions across the USA and the globe, with personal care and discretion. Christian’s many years of experience as a chef have taken him around the world and won him much respect and renown. It was while working as a private chef in Los Angeles that his vision for a placement agency dealing only with private chefs came to fruition. Currently, he devotes all his time to Private Chef’s, Inc. and its clients.